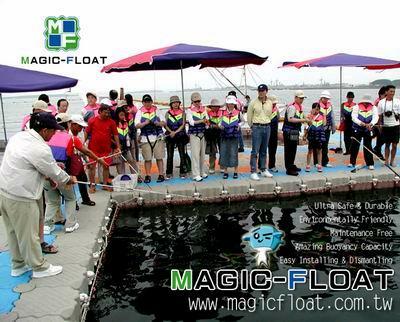 We (Magic-Float Enterprise Co., Ltd.) are a professional exporter and manufacturer of Magic-Float Modular Floating System located in Taichung, Taiwan. Our product, Magic-Float Modular Floating System, is best choice product for any leisure activities, sports or engineering programs regarding water. We not only use high density polythene (H.D.P.E.) import from Europe to make but also advanced��the structure of cube/pontoon itself so the floating application is safer, stronger and longer lifespan than other similar pontoon. Our product can be built as the following floating projects. > 13. water surface resort: hotel, beer house, coffee shop, etc. > 15. many applications beyond imagination.